X-ray diffraction (XRD) is a tool for characterizing the arrangement of atoms in crystals and the distances between crystal faces. The technique reveals detailed information about the chemical composition, crystallography, and microstructure of all types of natural and manufactured materials, which is key in understanding the properties of the material being studied. Since many materials can form crystals—such as salts, metals, minerals, semiconductors, as well as various inorganic, organic, and biological molecules —X-ray crystallography has been fundamental in the development of many scientific fields. The method determined the size of atoms, the lengths and types of chemical bonds, and the atomic-scale differences among various materials, especially minerals and alloys. The method also revealed the structure and function of many biological molecules, including vitamins, drugs, proteins, and nucleic acids such as DNA. Samples are commonly analyzed in a crystal form. X-ray diffraction is caused by constructive interference of x-ray waves that reflect off internal crystal planes. A thin film or layer of powder is fixed in the path of monochromatic x-rays. A detector measures x-rays from the sample over a range of angles. The powder consists of tiny crystals randomly oriented. At certain angles of the sensor, populations of crystals have the correct angle so that Bragg’s equation is satisfied for one of the crystal planes, resulting in a spike in X-rays. The output graph displays x-ray intensity over 2 theta, the angle of the detector. The data generated with this technique requires extensive mathematical analysis that is now made easier by available computer algorithms. 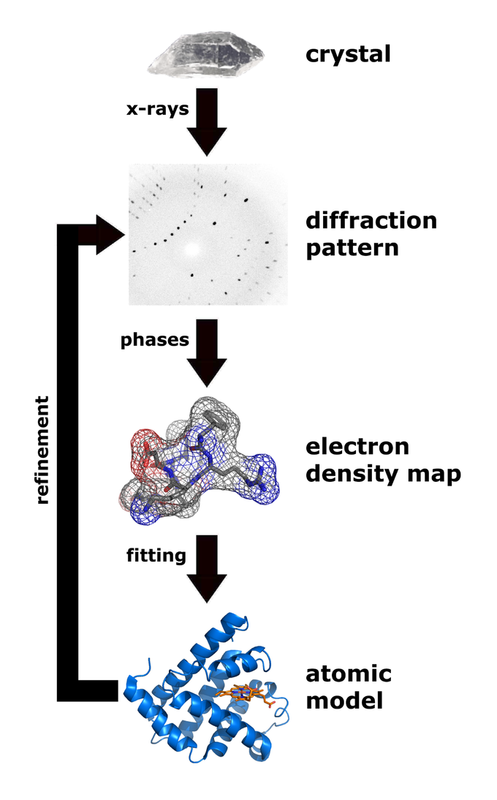 The analysis consists of indexing, merging, and phasing variations in electron density. It begins with the identification of molecules using the international center for diffraction database (ICDD). This is an organization dedicated to collecting, editing, publishing, and distributing powder diffraction data for the identification of crystalline materials. Further analysis involves structure refinement and quantitative phase using the general structure analysis system (GSAS), which ultimately leads to the identification of the amorphous or crystalline phase of a matter and helps construct its three dimensional atomic model. Structure determination by X-ray crystallography: X-ray diffraction analysis workflow. In an X-ray diffraction measurement, a crystal is mounted on a goniometer and gradually rotated while being bombarded with X-rays, producing a diffraction pattern of regularly spaced spots known as reflections. The two-dimensional images taken at different rotations are converted into a three-dimensional model of the density of electrons within the crystal using the mathematical method of Fourier transforms, combined with chemical data known for the sample. X-ray diffraction utilizes x-ray beams targeted to hit crystallized matter and generates a diffraction pattern. Data collected using this method undergo a systematic analytical process that employes mathematical models and computer algorithms to obtain the final 3D atom model of a matter. X-ray diffraction analysis identifies composition and chemical bonds between atoms of crystal, liquid, powder, or amorphous samples. Bragg’s equation: Gives the angles for coherent and incoherent scattering from a crystal lattice. crystallography: The experimental science of determining the arrangement of atoms in solids.